1. Brandy studied in Asia, which broadened her perspective and gave her a deep appreciation for global issues. 2. She got into the maritime industry by accident, joining the Port of San Diego simply to work for a public agency and because she thought the job would be interesting. She enjoys leading an organization that operates in a highly competitive arena driven by the private sector, yet serves the region with a mission for public good. 3. Brandy visited New Orleans for the first time for a maritime training course and fell in love with the city. When she learned that the Port of New Orleans was looking for a Chief Operating Officer, she jumped at the chance to serve. 4. Brandy is one of an elite group - fewer than a dozen female port directors in the U.S.
5. One of the other female port executives, Randa Coniglio, was her mentor at the Port of San Diego. 6. 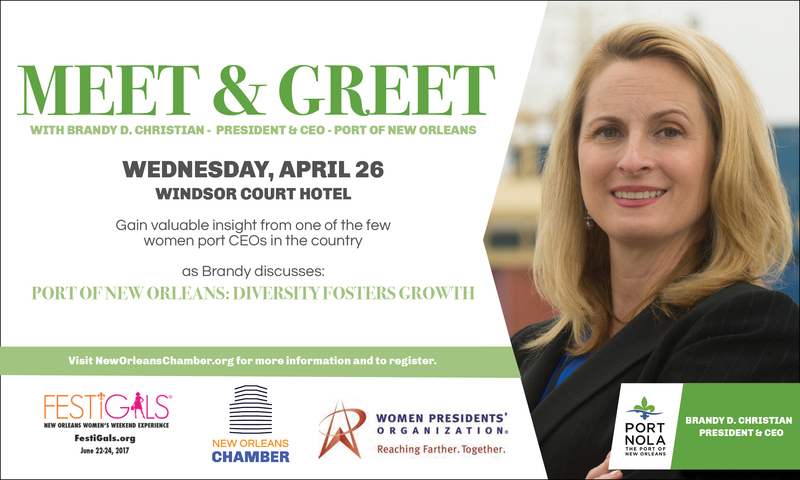 Brandy has a special affection for cruise and has worked for two ports, San Diego and New Orleans, while each ranked 6th largest cruise port in the United States. 7. At the Port, Brandy strives for continual improvement and is guided by Quality Management and Six Sigma training. 8. Brandy is married to a 610 Stomper and has an 11-year-old daughter. 9. She enjoys scuba diving and any activity involving sand and waves. 10. Brandy attended two Pac-12 schools – University of Arizona and USC. Register For the Meet & Greet!